Xocolatl was the name of ceremonial drink the Aztecs of Mexico served the Spaniards in 1519; now referred to as chocolate. MOCAFE� has recreated this drink using original recipes to produce Azteca D�oro 1519 Mexican Spiced Ground Chocolate. Laced with fragrant spices such as cocoa liquor, real vanilla, almond, and cinnamon. Azteca D�Oro Mexican Spiced is the most delicious ground chocolate found anywhere. 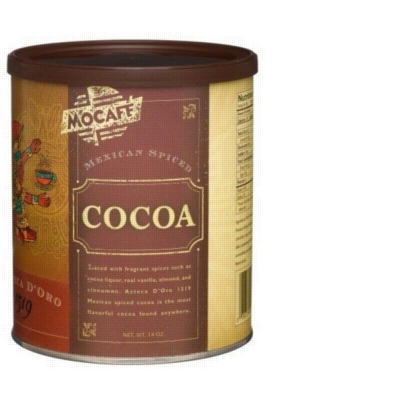 Use MoCafe Azteca D�Oro Mexican Spiced Chocolate to create unique mochas by adding a shot of espresso, make delicious hot cocoas, or blend it up to create decadent mocha frappes. Sold in a 14 oz. can.